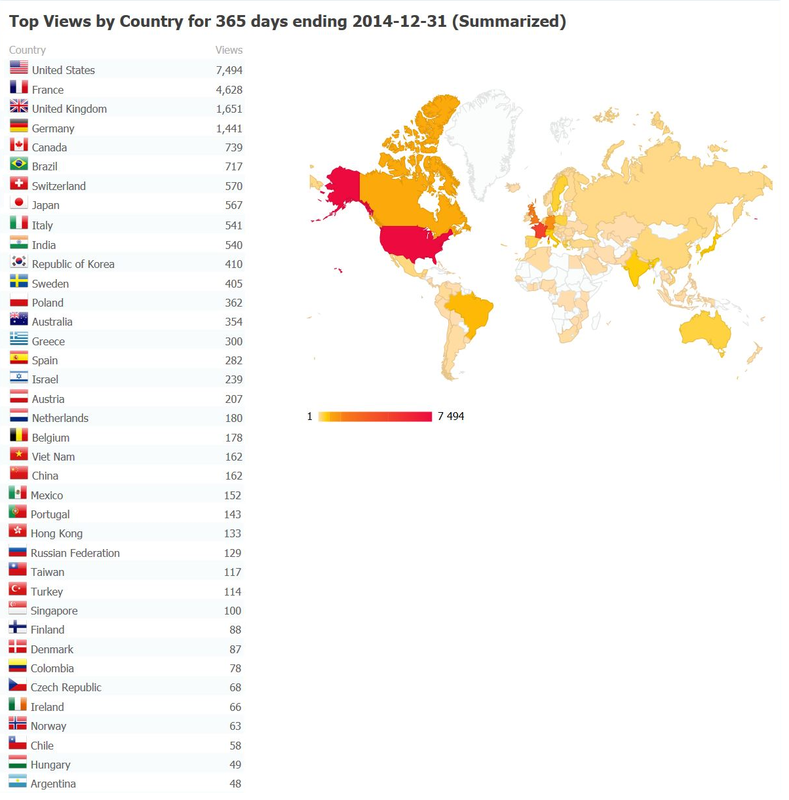 – june: breakthrough prize ? As a follow-up to a previous post, let’s mention that a few days ago Mochizuki has put online a report concerning activities devoted to the verification of his Inter-universal Teichmuller Theory (IUTeich). A fascinating read, I can’t remember anything of the sort from a serious mathematician in the past two decades (correct me if I’m wrong). page 2: Yamashita has been writing a survey since 2013 concerning IUTeich […] It appears that the survey will come to a total of roughly 200 ∼ 300 pages in length (i.e., roughly a tenth of the size, in terms of the number of pages, of the original papers — a quite staggering compression ratio!). understand it in roughly half a year. — i.e., in their content, thoroughness, and meticulousness — the usual level of refereeing for a mathematical journal. of IUTeich is that at least with regard to the substantive mathematical aspects of such a verification, the verification of IUTeich is, for all practical purposes, complete; nevertheless, as a precautionary measure, in light of the importance of the theory and the novelty of the techniques that underlie the theory, it seems appropriate that a bit more time be allowed to elapse before a final official declaration of the completion of the verification of IUTeich is made. page 8: my current sense is that some date during the latter half of the 2010’s would be an appropriate time for the termination of such precautionary measures. page 9: in light of the present state of affairs, the only reasonable course of action lies in taking a long-term appproach to promoting the dissemination of IUTeich by cultivating a collection of researchers, one by one (and perhaps over many years of time), who gradually attain a deep understanding of IUTeich by studying the theory carefully and systematically from the beginning, i.e., in the style of Yamashita. Unfortunately, however, there appear to exist, especially among researchers outside Japan, quite strongly negative opinions and antagonistic reactions to the idea of “studying the theory carefully and systematically from the beginning”. He then presents five mathematico-sociological hypotheses that may explain that, and adresses each one. I’m curious to see if that report will initiate some changes in attitude towards his work, or any fruitful dialog. It does read as a completely sane and serious text. Apparently next january, on wednesday 21st, will be created a joint CNRS-IHÉS Laboratoire Alexander Grothendieck. That was fast! Several talks are being lined up, including one by Illusie titled “Remembering the SGA’S“. Registration is open until january 18th. Probably (and hopefully) all talks will then appear on the institute’s fine youtube channel. 3) the draft of a letter by Hermite from the 15th of june 1893 thanking the king of Greece for…yet another gold medal. and another one from 1939, a couple years before his death. One sees a very large library behind him, probably full of interesting items! From this seller I finally learned that in the summer of 2014 an old house had been advertised for clearing, and the belongings sold to different people locally. At this point it is unclear if most of what was sold then has been preserved: it is odd that the documents do not contain any of Picard’s reprints from before 1883, yet he had lots of papers before that. It is also suspicious that only one Hermite manuscript would be there. I’m fearing that some of the most interesting items have discreetly made it to specialized resellers and wealthy private collectors. Obviously, I’m not expecting all of Picard’s library to have been available anyway: he had five children, three of which died around WW1 while the two remaining daughters married physicists Louis Dunoyer de Segonzac and Jean Villey-Desmeserets (who had four children, one of whom had preserved those documents). So Picard’s library has thus probably been split between his pupils and the sons-in-law physicists in the 1940s, and then between the children and grand-children of all of them. 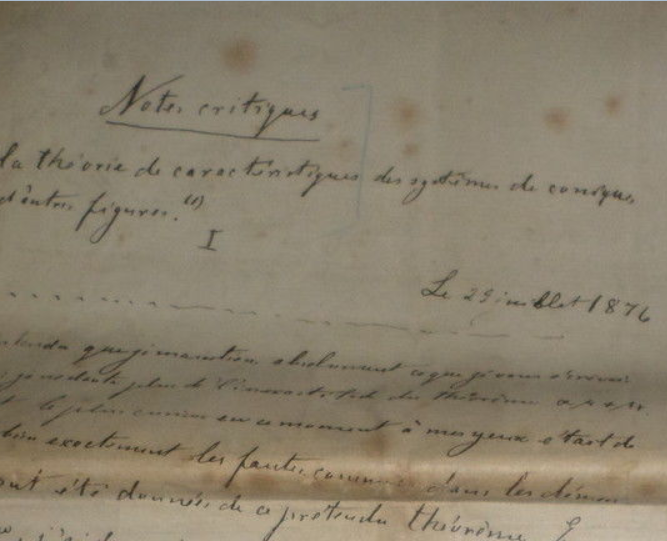 It was already known that the Villey branch had some items, since in 1970 Pierre Dugac had documented part of the correspondance between Hermite and Stieltjes (which, it is mentionned, had later been given to the Archives de l’Académie des Sciences), but what else there were is as yet unsettled. In a nutshell, Émile Picard has been one of the main french mathematicians of the 1880-1920 era. He’s been precocious (earning his doctorate in 1877 aged 20), prolific (from the full list of his notes to Comptes-Rendu de l’Académie des Sciences, one sees he had 8-10 per year at the beginning, not to mention his longer papers in other journals), and very versatile (he touched on most subjects of those times, including relations with physics). He thus obtained lots of honors, including Pleanary Speaker (1908) and President (1920) of an ICM, and Grand-Croix de la Légion d’Honneur (the highest, very select, grade). 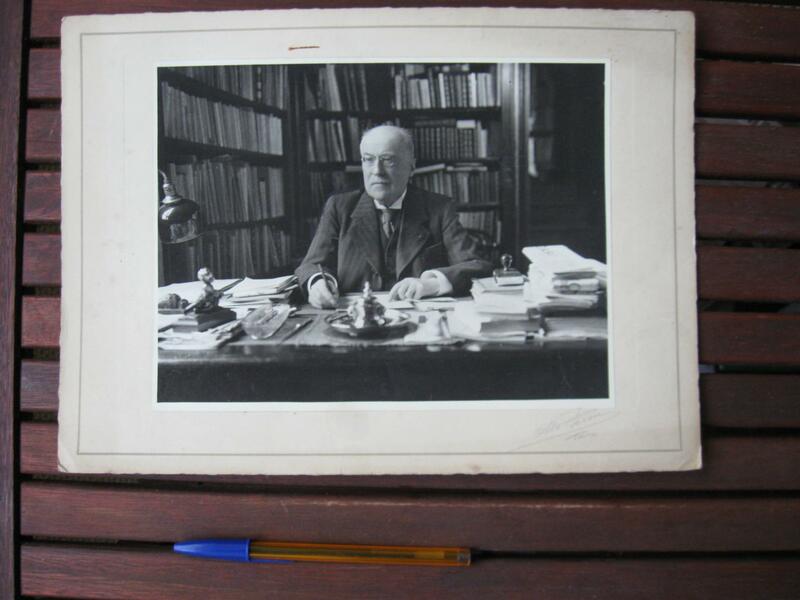 In 1917 he became permanent secretary of the Académie des Sciences, and controlled most of what was being published in France, sometimes to ill-effects. But in this post we’ll focus on his early career, since that’s what the documents obtained shed some light on (see the story). 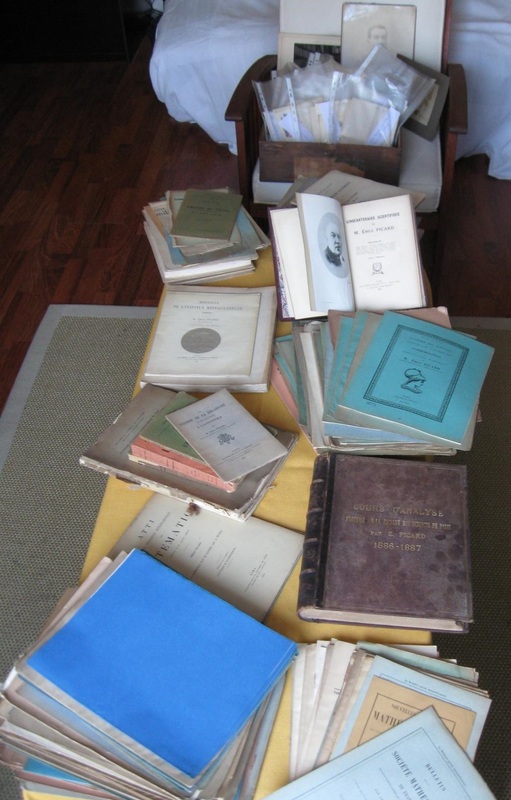 They can be broken into three parts : (a) a stack of letters that Picard’s mother had kept, (b) Picard’s own copy of his 1886-87 Cours d’Analyse, (c) reprints of many papers, and books written by him. About that last item (c) I shall say no more, since they are just what appeared in print at the time with no handwritten additions (so the content available in libraries or online –see numdam for many papers, and archive.org for some papers and his books— is identical). 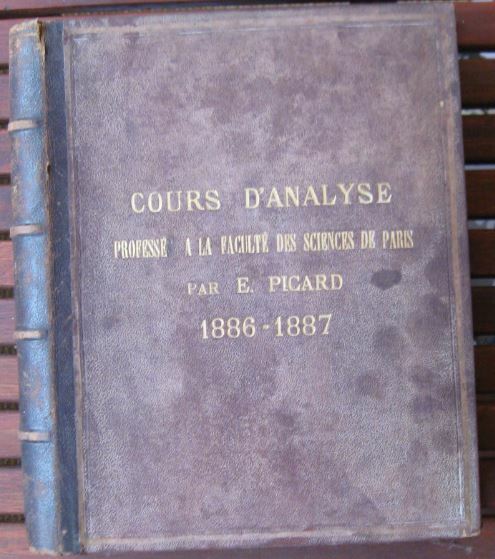 According to the Académie des Sciences, in 1885, after junior positions in Paris and Toulouse, Picard became the tenured professor of the Chaire de Calcul Différentiel et Intégral at Faculté des Sciences de Paris (until 1897 when he took up another position). In 1887, his course was edited (here is the GDZ digitized copy) by l’Association Amicale des élèves et anciens élèves. This served as a precursor to Picard’s highly regarded Traité d’Analyse (vol. 1, vol. 2, vol. 3) a few years later. The copy obtained was Picard’s, and contains lots of handwritten additions. I’ve put pictures of all of them on this online album on flickr (and if you want to see in larger size you must remove the final part of the URL and add instead /sizes/h/ e.g. like on this picture). To help locate them in the book I’ve usually taken first a picture of the page number next to (or behind) which they have been made. These additions must then date from between 1887 and 1890 (when the new Traité appeared). I’m no history specialist, but I did try to see if among them one could find the first occurence of one of Picard’s ideas. Net result: probably not, or not entirely at least. Historians will tell in due course, hopefully. 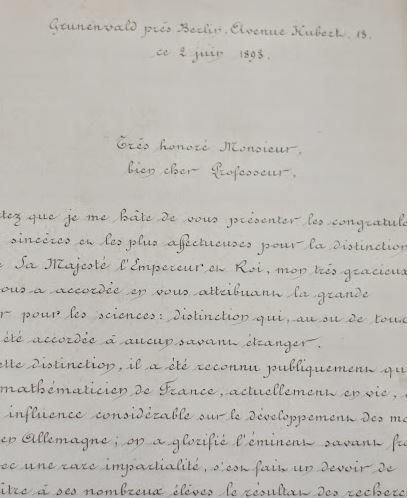 For example, as mentioned in his footnote on page 531 of vol.3 of his Traité, Picard first extended the ideas of Galois theory to linear ODEs in 1883 (in this CRAS note) and later came back to it in 1887 (the year of our copy, then). We do find some pages (starting here) where he discusses what became later known as the Picard-Vessiot group of an ODE. He uses different inks, so it looks like he wrote that in stages as ideas came to him, but was that just material for his students, or stuff for his own understanding ? Tom Archibald wrote on that topic a paper that probably settles the issue (but it’s behind a paywall and I haven’t read it yet). There are also two pages (one, two) that mention birational transformations and cycles in relation to a theorem of Max Noether, when it is known that Picard’s involment in then nascent algebraic geometry ranges from 1884 to 1905, according to Houzel’s chapter in Gispert’s book (see also Lefschetz’s 1968 autobiographical sketch in Bull. AMS, as well as the introduction to Kleiman’s paper The Picard Scheme). The parts on more traditional topics like uniform continuity probably don’t contain anything new, since according to Hairer and Wanner’s excellent Analysis by its History these concepts date back from much earlier. But perhaps the parts on existence of solutions of ODEs do (the chapter starts here) : after all, Picard’s method of successive approximations dates precisely from about 1888 (the method itself dating back to Liouville but not applied to existence results, see Archibald’s very interesting paper, in particular page 86 onwards). That’s it for the mathematical part of the documents. We now turn to the more biographical part (a), which helps correct some inaccuracies in online biographies, and adds new material. (a) Letters adressed to Élisa Picard (née Plocq) on the occasion of her mariage in 1852 (nothing about Émile there then). (b) Letters to Élisa from her husband, and a letter of Élisa to a cousin. (c) Letters to Élisa on the occasion of her husband’s death in 1872, after a long illness. (d) Letters from Alexandre Plocq and his wife. He was a cousin of Élisa and had been entrusted as the one to provide guidance to Émile and his younger brother Édouard. Indeed it seems to have been a good choice : in those letters this Alexandre appears as a very righteous man, with high regard for studies and hard work. He himself enjoyed a high social status as Ingénieur en Chef des Ponts et Chaussées at the harbor of Dunkerque, which he obtained as a former top student of l’X (École Polytechnique). In particular, he appears to have been instrumental in both children obtaining a full bursary to study. (e) Letters of congratulations adressed to Élisa on the occasion of academic successes of her sons. (f) Letters to Élisa from a cousin living in New-York (an uncle of Émile then). (h) Letters to Élisa from Émile. 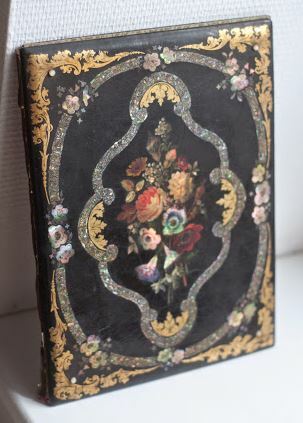 There are several ones from 1887, including some not very sympathetic remarks about his father-in-law Hermite (who, apparently, was a bit of a grumpy old man by then), and the occasional odd XIXth century idea (“le passage du col du géant n’est vraiment pas à recommander pour la coqueluche“). There’s also an earlier touching one from october 29th, 1880 where Émile (aged 24) finds Hermite’s daughter “de mieux en mieux et elle me plait infiniement” but wonders how to know whether M & Mme Hermite have any plans for himself, and asks his mother what she makes of this. (j) Letters to Élisa on the occasion of Émile’s marriage. 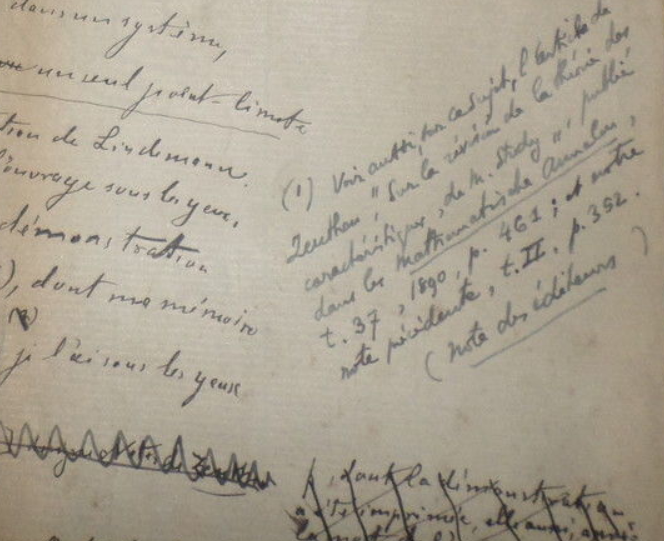 (k) Letters to Émile from his younger brother Édouard. 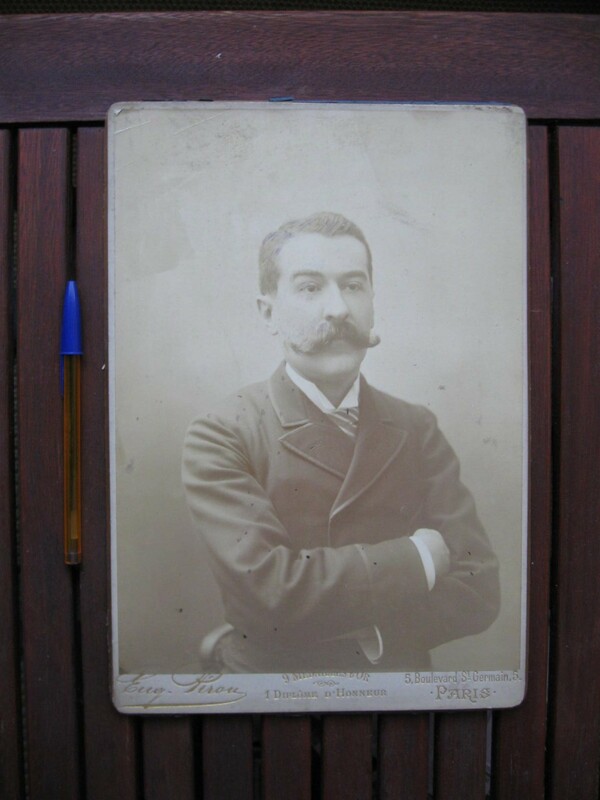 This brother was also very talented, he entered l’X and became a top student there (and became Ingénieur des Ponts et Chaussées, just like his mentor Alexandre Plocq). Although they also met in Paris, Édouard tells Émile how he is doing academically (note: in France marks are out of 20, e.g. 17 is quite good, especially for oral exams such as colles). (l) Letters to Élisa from the brother Édouard, including many from Algeria where he later worked (I must say I haven’t read most of those). Next post : Other items. It is an ancient tradition in Germany that upon reaching 50 years after obtaining their doctorate, old scholars would have a party thrown up in their honour called a jubilee (from this book it appears that in the early XIXth century von Goethe had one). Not many people reached their seventies in those days, and the first mathematician to celebrate his jubilee very probably is Gauss (in 1849), while later occurences include Weierstrass in 1885 (the year he proved that theorem), and von Helmholtz in 1891 (a very big one, with hundreds of guests and several ministers and foreign officials in attendance). Elsewhere in Europe, I could only find cases in the late XIXth century. In France, it seems probable that the first ever was that of Hermite on december 24th, 1892. In the UK, Lord Kelvin had his in 1896. Which thus brings us to Hermite. If you don’t know the man and you happen to understand french, there’s an interesting hour-long conference by historian of mathematics Catherine Goldstein from 2013 which is worth watching. Readers of english can consult this paper by Tom Archibald. To sum up, Hermite has been a very creative and influential mathematician (indeed the leading figure in France in the 1860-1880 era), and played also a pivotal role in the diffusion in France of important works by german mathematicians (with whom he corresponded extensively). – more than two dozens of similar formal unbound documents from many academies and scientific societies : Belgium, Italy, Germany… — but not the UK, why so ? The stand-out one is probably from Berlin, signed by von Helmholtz, Weierstrass, Kummer, (? ), von Bezold, E. DuBois-Reymond, Kundt, Vogel and Fuschs! – several dozens congratulatory telegrams sent just in time for the ceremony on the 24th (from all over Europe except the UK –again– even one from the US by Newcomb). To view all the corresponding pictures, please go to this online album on flickr (and if you want to see in larger size you must remove the final part of the URL and add instead /sizes/l/ e.g. like on this picture). Overvall, nothing scientific per se here, but that’s a nice set documenting the beginnings of the makings of the international mathematical community : the first ICM was held in Chicago six months later, in august 1893 (Hermite, like most europeans, couldn’t attend, but he did contribute a paper which was read there). On that topic, it must be noted that a very comprehensive book edited by Karen Hunger Parshall and Adrian C. Rice has been published by the AMS in 2002 (I do hope to read it one day). For the record, a few days later Louis Pasteur’s jubilee also took place at the Sorbonne (with a much bigger crowd, which is not surprising given his life-saving work and examplary scholarly attitude). And, among the documents given to him, there’s one listed that probably is very similar to Hermite’s (the one from l’Académie Impériale des Sciences de St-Pétersbourg). Next post : Picard’s youth. Very surprisingly, I ended up being the sole bidder on all but one item (the one with the gold-plated cover). A possible explanation is that these were quick 3-days auctions in mid-week in the middle of summer (as I realized later, some of the lots had even been put up twice for auction and didn’t sell, so this has been a very lucky outcome indeed). The manuscript with the editorial note, which was much more expensive at 99€, is the only one I didn’t bid on, believing at the time that with probably many more such papers to come I had to optimize my money and wait for a ‘better’ one (since Picard edited the Collected Works of Hermite, and since a quick check showed this particular paper didn’t make it in there, I thought it might be one of lesser significance). Somebody else did buy it, as I recall. 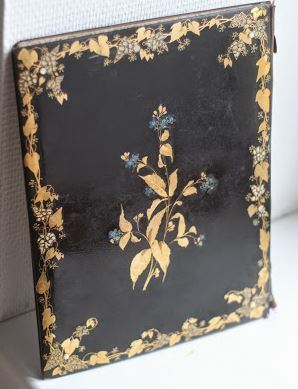 Luckily, the gold-plated item I got through second offer: I had bid as much as I could and lost, but the seller only accepted french cheques while the auction winner was abroad and not willing to use that payment method. Luck, again. In the other posts of this series are described these items in more detail. But it didn’t end there. Indeed, the seller had told me they came from a garage sale, but couldn’t remember where. Some other documents purchased made it clear that these came from the family of a son of Jean Villey-Desmeserets, a physicist who had married one of Picard’s daughters. I was now convinced that more items were to be found, at least some more Hermite manuscripts. My aim obviously being one of preservation, and sensing I wouldn’t be able to obtain much more (since I did manage to contact a grand-daughter of Jean Villey-Desmeserets but got no further information), I finally contacted the Archives of the Académie des Sciences where they are now held (see the other posts for full sets of pictures). In fact, as is explained next, some further twists occured before I gave the lot to the Archives. 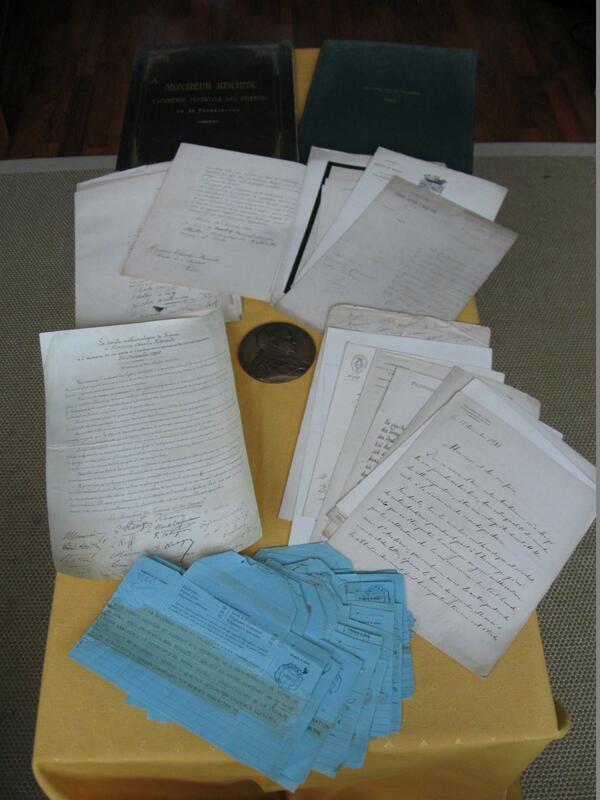 Next post : Hermite’s 1892 jubilee documents.